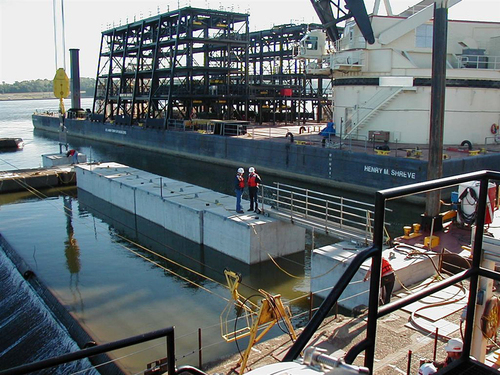 Under a second contract, three years later TJC fabricated structural concrete segments to act as a unit gravity dam and allow the USACE LRS to dewater sections of the Ohio River for “dry condition” work around marine structures such as the lock and dams and “Bear Trap” at Lock and Dam 52. 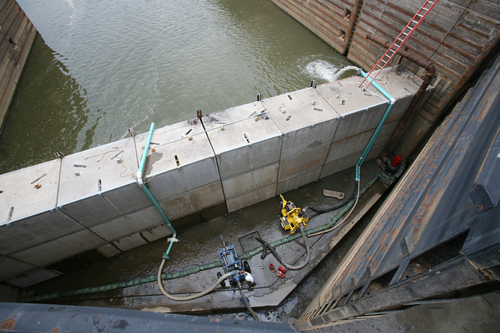 The second contract resulted from the Pittsburgh District needing to use the gravity dam system to complete emergency dam repairs. The 550 Ton Shreve Crane lifts a stack of blocks three high for a total weight approaching 165 tons and sets the stack side by side in the river to establish a “portable coffer dam”. The structural concrete elements stack a maximum three high through a system of complex sleeves and hooks. Construction tolerances during fabrication never exceeded + or – 1/8 of an inch for these 55 ton concrete units. TJC designed a heavy duty forming system with an intricate set of jigs and templates for block outs in order to achieve the close tolerances required by the system. This design incorporated stronger embedded “lifting lugs” which required significantly more internal form construction. 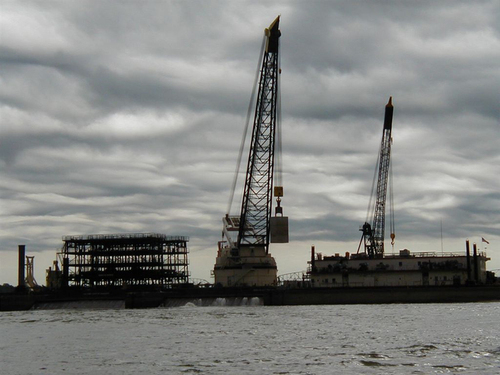 Ancillary features of the blocks provide for a rubber seal along the bottom and hand rail insets for the blocks designated for the top of the stack. TJC load tested the block hook strength to document that the design fell within the safe lifting range.